Red Theater Chicago at the Den Theatre. By Aaron Sawyer. Directed by Sawyer. With ensemble cast. 2hrs 30mins; one intermission. 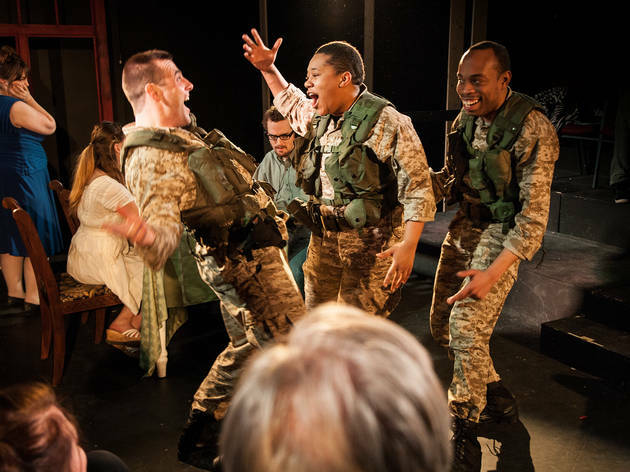 In case the combination of melodramatic characters, manic tone shifts and forced intensity didn’t assault the senses enough in Red Theater’s Three Soldiers (for Sisters), the show is also painfully loud. 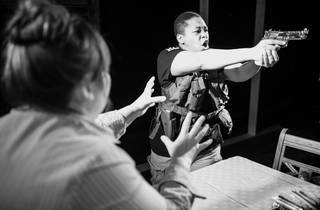 Under the right circumstances, shrill screams, gunshots and blaring music in a play can create an atmosphere of heightened dramatic tension—an effect Three Soldiers seemed to be grasping for in many of its missteps—but in this case the unpleasant auditory experience is just another abrasive element in an all-around heavy-handed show. Writer-director Aaron Sawyer’s “aggressive retelling of Anton Chekhov’s Three Sisters” is just that—aggressive—but unfortunately not in the raw, provocative way the cast and crew may have had in mind. 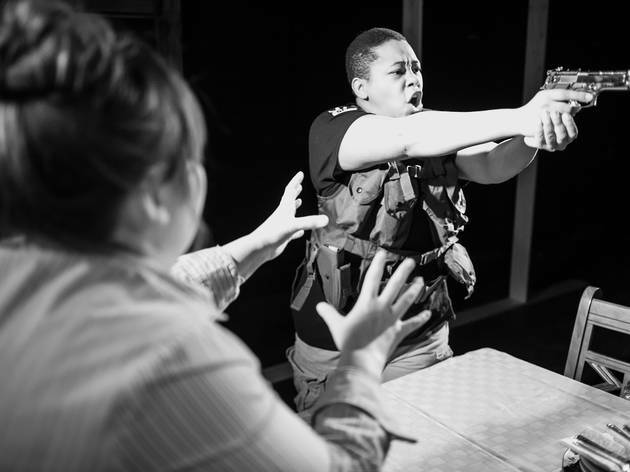 Sawyer has taken Chekhov’s already busy turn-of-the-century work and tilted it through a depressing lens of modern-day warfare. The soldiers that come calling on sisters Olga (Susan Wingerter), Maria (Meredith Ernst) and Irna (Sarah Liken) are damaged veterans of conflicts in Iraq and Djibouti, where the family is stationed, in place of the Russian lieutenants and captains from the original. Like its predecessor, the play paints (however clumsily) a portrait of a family coming to terms with its crushed dreams and fading stature in an evolving world. It’s an ambitious concept. Clearly too ambitious here. Dialogue is stiff at best, just plain unrealistic at worst (fine, the show is inspired by a 1900 script, but “frightful”?). Ghostly narrators appear, presumably to hammer home the emotional and psychological toll of war, and hammer they do, until the message is battered, bruised and far less effective than it should be—with "Proud to be an American" smugly blaring in the background. Perhaps the most off-putting element, though, is the core characters. Aside from Victoria Alvarez-Chacon’s easygoing portrayal of protective soldier Cookie, the family members and their visitors are universally unlikeable, which wouldn’t necessarily be an issue except that they’re not compelling either, and nearly three hours is far too long to sit through a play about people you don’t care about. In military terms, the doctrine of shock and awe is about overwhelming power and might. In its effort to evoke power emotionally, Sawyer is wise to choose a subject matter as dramatic as the troubling reality of our modern armed forces. 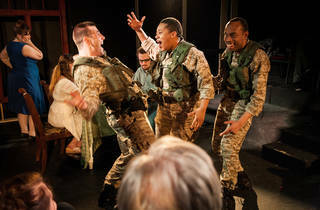 It's focusing only on the overwhelming part that robs Three Soldiers of its potential might.